Devotion, Not Devotions Do you have to have ‘daily devotions’ to be a good Christian? Are You Emotionally Mature? In this age, people no longer base decisions and actions on solid moral values. They have been programmed to act according to their feelings. Emotions are something that all Christians must battle. Are you controlling your emotions? Do You Need Spiritual Exercise? If you are wondering where the joy and peace is you may be spiritually run down and need to ask yourself the obvious questions.- "Am I exercising myself spiritually? 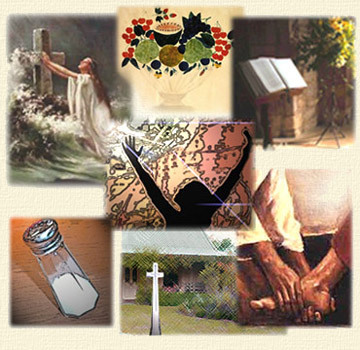 Am I receiving sufficient spiritual nourishment?" You can not expect to sit in church and be spiritually nourished one hour per week, be influenced and motivated by the world the rest of the week, and expect to experience the joy and peace Jesus promised. Your diet and your exercise are not properly balanced. God’s Tests This is the very first principle we too must grasp if we are to understand anything about God’s tests: Trust must be earned. God only promotes those whom He can trust. For that reason, He will test us to see if we can be trusted.